Earth was created, destroyed, then naturally renewed. We are born into the world as if from nowhere, souls protesting at our entry with all the strength of our perfect lungs, as we breathe in the air around us. But we cannot remember our birth, and as we pass into adulthood, we begin to ask questions about man’s and the world’s origin, only to find that man too has no memory of how he came to be. Existence is a mystery. Having more credulity than curiosity, many assume that the planet that is our home during our brief lives had a natural origin. But is it reasonable to attribute nature with its own creative power, even to the extent of producing things incomparably more complex than human intelligence and technology can engineer? Can human life really be reduced to atoms, contrary to our sense of being distinct from our bodies and the physical world beyond? In recent decades it has become difficult to ask these questions in an open-ended way. Scientific institutions, educational establishments and broadcasting media all permit but one view of reality: the world created itself. Any other view else is mere religion. But doubt persists in sidling in. We live from day to day knowing that life is something different from molecules. Life involves consciousness, something that plants, which also reproduce via DNA, do not have. Our experience of ourselves as conscious beings tells us that there is more to reality than can be accounted for by molecules, however complex their organisation. Life is inherently and irreducibly wonderful. What we have done in rejecting theistic explanations – in declaring that God was not “a magician, with a magic wand able to do everything” – is simply transfer the power of miracle from God to Nature, using scientific language to dress up a belief in natural magic. Not that creation in 6 days provides a straightforward answer. While the glory of the heavens, the majesty of the continents and oceans and the secret lives of the animals that share our world all appear to deny a natural explanation of their existence, they do not speak directly of creation, because nothing is as it was. Everything lies at the end of a long history. Creation cannot be read from the universe’s present appearance. Moreover, we cannot go back to the beginning because a cataclysm near the beginning destroyed the original land. We have become aware of this only in the last 40 years, as a result of discovering that the Earth’s oldest crust is missing. The impact craters which defaced the Moon just prior to the beginning of the rock record destroyed Earth’s earliest record. Asteroids, combined with torrential flooding, rendered the planet formless and barren. 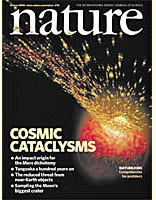 It is this primeval cataclysm that offers the key to understanding the fossil record. After the bombardment the planet was in geological flux. Species had to colonise new seas and lands, and to diversify as they met the challenges. Bacteria were the first organisms to appear, not because they were the simplest but because they were the most prolific, and everything else depended on them, not least for the continuing production of oxygen. Other organisms gained a foothold as land surfaces stabilised: mosses, lichens, low-lying wetland plants and forest-forming trees in ecological succession, joined by an equally diverse range of animals millipedes, insects, mites, spiders, scorpions, reptiles. Evolution has two meanings. The first is the well established fact that all species originate from other species; the second, the presumption that all species, from bacteria to human beings, are related to one another and originated aeons ago from self-organising chemicals. Conditioned to think about such things without thinking, we tend to confound the two. When new species originate, we think we are seeing evidence for the theory that life evolved from a prebiotic soup. In reality there is no such evidence, and documented examples of evolutionary change cannot be explained in Darwinian terms. Their evolution is as miraculous as the creation of the progenitors with which their history began. Nonetheless, many theists deny that such transformations could have happened because they seem too miraculous, while atheists invoke god-like natural selection in order to deny the miraculous. An argument from incredulity on the part of believers, an argument from credulity on the part of unbelievers! The more spectacular the transformation or prodigal the diversity, the more it becomes clear that such phenomena were not the work of chance but pre-programmed just as the single-generation metamorphosis of a caterpillar into a butterfly, or of an egg into an ostrich, is evidently pre-programmed. Evolution of this kind in no way implies the denial of an original creation. Survivors from the cataclysm were endowed with enormous potential to diversify because there were so few of them. They were endowed with the potential to adapt because they had to colonise a world that, beginning from total devastation, had to pass through multiple stages of ecological renewal. Earth history took place over a succession of ages, and inevitably the names of these ages will be unfamiliar to most readers. Be patient while you become used to them. We recognise that Earth history is not generally taught at school – that adults know almost nothing about the origin of the world they are born into. The organising principle of the site is primarily chronological. First, a record of Earth’s colonisation walks the visitor through the early part of the fossil record, illustrating how the step-by-step appearance of plants and animals reflects a process of ecological recovery (Archaean to Devonian). The antediluvian world steps still further back in time to look at what the original world was like (before the Archaean). The old world destroyed argues that evidence generally taken to go back to the solar systems birth is actually evidence of its destruction. 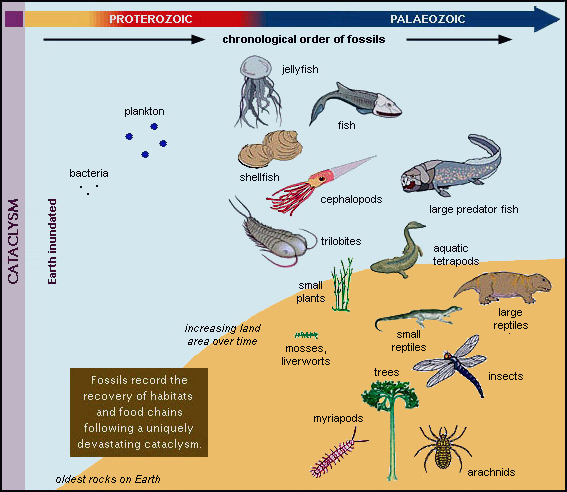 Transitional fossils discusses, in chronological order, the top ten examples of evolution, from fishes to man (Devonian to Quaternary). The age of the Earth discusses how the planet is dated and why timescales of millions of years should be treated with scepticism. A series of diagrams and timecharts provides visual aids. Key concepts summarises the new approach, followed by pages that treat some concepts in more detail. In-depth discussions engage the reader at a more technical level, with topics such as the origin of the solar system and the recently discovered transitional fossil Tiktaalik. Genesis and other traditions considers the testimony of traditions that predate the invention of writing, on the basis that they represent a lost memory of how the Earth came into existence. They too tell us that the original world was destroyed. Finally, The last days consider where we are now in Earth history. This is a quality site, honouring good scholarship and seeking to be a trustworthy voice amid a cacophony of voices speaking on the same topics. The less you skim, the more you will get from it. If you are looking to understand the meaning of Earth history, this site will help you.